This name uses Spanish naming customs: the first or paternal family name is Juliá and the second or maternal family name is Arcelay. Raúl Rafael Juliá y Arcelay (March 9, 1940 – October 24, 1994) was a Puerto Rican actor who received international recognition. Born in San Juan, Puerto Rico, he took an interest in acting while still in school. Upon completing his studies, Julia decided to pursue a career in acting. After performing locally for some time, he was convinced by entertainment personality Orson Bean to move and work in New York City. Julia, who had been bilingual since his childhood, soon gained interest in Broadway and Off-Broadway plays. He took over in the role of Orson in the Off-Broadway hit Your Own Thing, a rock musical updating of Twelfth Night. He performed in mobile projects, including the Puerto Rican Traveling Theater. Julia was eventually noticed by Joseph Papp, who offered him work in the New York Shakespeare Festival. After gaining visibility, he received roles in two television series, Love of Life and Sesame Street. For his performance in Two Gentlemen of Verona, he received a nomination for the Tony Award and won a Drama Desk Award. Between 1974 and 1982, Julia received Tony Award nominations for Where's Charley?, The Threepenny Opera and Nine. During the 1980s, he worked in several films, receiving nominations for the Golden Globe Awards, for his performance in Tempest, and Kiss of the Spider Woman, winning the National Board of Review Award for Best Actor for the latter. In 1991 and 1993, Julia portrayed Gomez Addams in two film adaptations of The Addams Family. In 1994, he filmed The Burning Season, for which he won a Golden Globe Best Actor award, and a film adaptation of the Street Fighter video games. Later that year, Julia suffered several health afflictions, eventually dying after suffering a stroke. His funeral was held in Puerto Rico, being attended by thousands. For his work in The Burning Season, Julia won a posthumous Golden Globe, Emmy and SAG Award. Julia was born March 9, 1940, in Floral Park, (Hato Rey), a suburb of San Juan, to Olga Arcelay and Raúl Juliá. He was the oldest of four brothers and sisters Maria Eugenia Juliá and Olga Maria Juliá. His mother was a mezzo-soprano who sang in a church choir before marrying Julia's father, who was an electrical engineer graduated from Tri-State University. Some relatives were also musicians, including his great aunt María González, whom he credited as the inspiration behind his artistic career. The family was Catholic. Raul's father was the founder of "La Cueva del Chicken Inn", a restaurant in San Juan. The building was originally a gas station and body shop,[clarification needed] before being remodeled after a similar restaurant in Madrid, Spain, called "Las Cuevas de Luis Candelas", which is intended to mimic the structure of a gypsum cave. Julia's father claimed that he brought pizza to Puerto Rico, after he hired an Italian cook in New York City that could prepare pizza. The restaurant is also supposed to be the first to distribute chicken-in-a-basket within the archipelago, which Miriam Fitts helped him think of. Julia was enrolled in Colegio Espíritu Santo in Hato Rey, a Catholic private school, where most of the personnel spoke exclusively English. There he participated in his first play in first grade, interpreting the devil, with his performance earning him participation in all subsequent school plays. After witnessing Errol Flynn's performance in The Adventures of Robin Hood, he decided to pursue an acting career. During his childhood, Julia's family followed a strict Jesuit practice, often bringing homeless children into their household. His mother received a recognition from the Catholic University of Ponce due to these efforts. By the seventh grade, Julia was able to speak English fluently and had gained interest in the works of William Shakespeare. Julia concluded his secondary education at Colegio San Ignacio de Loyola, where he would organize plays of Julius Caesar, Hamlet, King Lear, and The Tempest. Seeking to please his parents, he continued his university education spending a year at Fordham University, before returning to Puerto Rico, where he attended the University of Puerto Rico, becoming a member of Phi Sigma Alpha Fraternity. Julia continued acting in local plays and nightclubs. He studied liberal arts, earning a Bachelor of Arts degree. Julia eventually realized that he had no interest in pursuing a law career, which was favored by his parents, choosing to act full-time despite having doubts if he could sustain his needs working as an actor. Consequently, Julia began performing in several plays that were held in San Juan. He performed in a re-staging of Macbeth, which was held in one of the municipality's colonial castles in order to emulate the setting of the work. Other works included playing the role of Roderigo in Othello at a local drama production. Parallel to this, Julia began making presentations at the Ted Mack Amateur Hour. After joining a musical group named the "Lamplighters", despite receiving opposition from his parents, he was recruited by Lillian Hurst to perform alongside her, eventually receiving work at a hotel named El Convento. During this time, he began considering the possibility of moving to Europe to take acting classes. During one of their acts, Julia was approached by Orson Bean, who was on vacation in Puerto Rico, who provided him with contact information, wanting him to travel to New York and work there. His parents were shocked by the proposal, but ultimately agreed to support his decision. Julia's departure was postponed after his younger brother, Rafael, died in a traffic collision. During this time, he became engaged to Magda Vasallo Molinelli. In 1964, when he was 24 years old, he traveled to New York, arriving in the middle of a winter storm. After establishing residence in Manhattan, Julia had to do several odd jobs to pay for his expenses, going as far as receiving training on the proper way to sell pens for a distributor. When Hurst visited him, both attended a Broadway play and the fact that he could work as an actor full-time surprised him. As a result of this, Julia began seeking employment in both Broadway and "Off-Broadway" plays. Seeking to further improve his acting, he took lessons from Wynn Handman, who was recommended by Bean. His first work was a reenactment of Pedro Calderón de la Barca's Life Is a Dream, where he played Astolfo. This allowed him to receive the Actors Equity card from Actors' Equity Association. Initially, Julia received allowance from his parents, but after contracting Jeff Hunter as manager, he was able to perform in a staging of Bye Bye Birdie, declining further donations. He began performing with Phoebe Brand's mobile theatre, presenting plays in poor areas of New York. In 1965, he married Vasallo Molinelli. In 1966, Julia was cast for the role of Macduff in a Spanish version of Macbeth and performed in The Ox Cart, a stage play written by Puerto Rican playwright René Marqués. Miriam Colón Valle, who also participated in La Carreta, established the Puerto Rican Traveling Theater, where he performed. In 1967, the founder of the New York Shakespeare Festival (NYSF), Joseph Papp, attended a performance at Delacorte Theater, where Julia was reading patriotic Puerto Rican poetry. Subsequently, Papp offered him the role of Demetrius in a staging of Titus Andronicus. After this play concluded, he contacted Papp who offered him the job of stage manager in NYSF's Hamlet. While performing this task, Julia also performed in some of the plays. In September 1968, after auditioning four times for the role, Julia debuted in his first Broadway play, performing as Chan in a staging of The Cuban Thing. The following year he was cast in a reenactment of Arthur Kopit's Indians. During this timeframe, he divorced from Vasallo Molinelli. In 1970, Julia received the role of Paco Montoya in The Castro Complex, receiving favorable reviews for his performance. While rehearsing for an Off Broadway play, he met Merel Poloway, forming a relationship with her. As he gained prominence on Broadway, Julia was cast in two television series, Love of Life and Sesame Street. He disliked his role in Love of Life and only appeared on the show for a brief time. His Sesame Street characters, Rafael the Fix-It Man, was a recurring character during the show's third season. Rafael the Fix-It Man ran the Fix-It Shop with Emilio Delgado's character Luis, who debuted with Julia on the show. Between 1971 and 1972, Julia earned roles in The Organization, The Panic in Needle Park, and a film adaptation of Been Down So Long It Looks Like Up to Me. While working in Sesame Street, Papp contacted him and offered the role of Proteus in Two Gentlemen of Verona. For his performance in this play, Julia received his first nomination for a Tony Award and won the 1972 Drama Desk Award for Outstanding Performance. In 1973, he interpreted Edmund in King Lear. This was followed by the role of Orlando in As You Like It. Julia noted that he cherished the roles he played in these Shakespeare plays, particularly the rhythm, music, and poetry present in them. He also acted in Via Galactica's limited presentation in Broadway and, on television, played Dr. Greg Robinson, Jerry's brother, in the "Oh, Brother" episode of The Bob Newhart Show. In 1974, he was cast in the lead role of Where's Charley?, playing Charley Wykeham. Julia received his second Tony Award nomination for his performance in this comedy. He subsequently joined Erhard Seminars Training or "est", an organization that promotes self-motivation, by participating in its seminars. In 1976, Julia played Mack the Knife in The Threepenny Opera, interpreting the dialogue with a marked British accent. The performance earned him a third Tony Award nomination. He followed this performance with a turn as Italian car racer Franco Bertollini in The Gumball Rally. That same year Julia married Poloway in the Catskill Mountains. The ceremony was led by Swami Muktananda as part of a spiritual retreat. The couple had met the Swami through Werner Erhard, founder of "est". After this retreat, Erhard founded "The Hunger Project", claiming that after traveling to India, he felt motivated to found a non-profit organization to eliminate world hunger through philanthropic galas. Julia joined the initiative since its conception, establishing a personal goal of raising one million dollars for the organization. In 1978, he accepted the lead role in Dracula, receiving a good reception for his interpretation of the character. While performing as Dracula, Julia also played Petruchio in The Taming of the Shrew. The interaction with co-star Meryl Streep was tense at first, before developing into a friendship as the production advanced. Julia then accepted a role in a film adaptation of The Tempest, spending several months in Italy while exploring its culture. While in the country, he received the script for Nine for which he would later receive his fourth Tony Award nomination. In preparation for his role in Betrayal, Julia moved to London temporarily, hiring a coach to adapt his accent to the English dialect. Julia would later adopt an English accent for most of his future films. In 1982, Julia played Calibanos in Mazursky's Tempest and Ray in the musical One from the Heart. In 1983, his first son with Poloway, Raúl Sigmund Juliá was born. That year he also starred in the public television film Overdrawn at the Memory Bank, which received a weak reception and was satirized on Mystery Science Theater 3000. After not appearing in a film for two years, Julia played a political prisoner named Valentín in an adaptation of Manuel Puig's Kiss of the Spider Woman. Considering that the script was unique, he agreed to begin filming before receiving his salary and traveled to South America, where he interviewed rebels and ex-prisoners to familiarize himself with their experiences and ideology. Upon its release, the film was a commercial success. For his performance, Julia received a nomination for the Golden Globe Award and won the National Board of Review of Motion Pictures' award for best actor along with co-lead actor William Hurt. The following year, he appeared in his first Puerto Rican film, La Gran Fiesta, offering a monologue near the end of the film. In 1985, he starred as Major Sergius Saranoff in an adaptation of Arms and the Man. This was followed by the role of David Suárez in the romantic comedy Compromising Positions. In 1986, Julia played a hairdresser named Joaquin Manero in The Morning After. To prepare for the role, he took lessons and worked at a hair salon for some time. In 1987, Julia had the lead role in The Penitent. Later on that year, his second son with Poloway, Benjamín Rafael Julia, was born. In 1988, Julia played a corrupt official in Moon over Parador, which received negative reviews from critics. The following year, he co-starred with Anthony Quinn in Onassis: The Richest Man in the World, a biographic film covering the life of Aristotle Onassis. In 1989, Julia was cast as Archbishop Óscar Romero in the biographical movie, Romero. During his life, Romero had been an advocate of human rights, often denouncing violations of these rights in public, which prompted his assassination during a mass. Julia accepted the role based on its political nature, seeking to draw attention to the issues in that Central American region. To prepare for the role, he read Romero's diary and autobiography as well as listening to or watching recordings of his messages and Masses, which prompted him to rejoin the Catholic Church. He and Poloway, who is Jewish, decided not to raise their children in a particular religion, believing that they should make their own decision after growing older. The government of El Salvador refused to allow distribution of the film because of its content, so that the film received only clandestine circulation. Due to his activity between 1987 and 1989, Julia was ranked first in Variety's "List of Busiest Hollywood Actors". Julia then starred in the film adaptation of The Threepenny Opera, recreating the role of Macheath in the movie, which was renamed Mack the Knife for its American release. In 1990, he was cast to play a lawyer in Presumed Innocent, receiving solid reviews for his performance. Prior to the filming, Julia spent time in courtrooms and studied the court system. Also in 1990 he appeared opposite Robert Redford in Havana but chose to remain uncredited because the director, Sydney Pollack, refused to give him above the line credit. In 1991, when Papp died, Julia commented that the director was directly responsible for finding him roles besides that of "stereotypical Latinos" such as that of the "Latin lover". Julia was cast to play Gomez Addams in an adaptation of The Addams Family. He was attracted to the role because of the character's irreverent portrayal, noting that "even his depressions are wonderful." Since his earlier recollections of the role were those from the Spanish-dubbed version of the first television series, he had to adapt the role directly from the original cartoons drawn by Charles Addams, receiving a nomination for a Saturn Award. In 1992, Julia played the title role in Man of La Mancha with Sheena Easton, a Broadway adaptation of Miguel de Cervantes' Don Quixote. The play had originally begun in 1965, with the main character being played, at one time, by one of his favorite actors, José Ferrer. Julia performed this role eight times per week. Subsequently, he reprised his role as Gomez Addams in Addams Family Values. In 1994, Julia played Chico Mendes in The Burning Season for HBO, for which he received solid reviews. He familiarized himself with the role by analyzing interviews and footage from Mendes' Xapuri Rubber Tappers' Union. In early 1994, while filming The Burning Season in Mexico, Julia contracted food poisoning after consuming sushi. Because he had undergone stomach surgery a few months earlier for an infection which was rumored to be stomach cancer, Julia was airlifted to Los Angeles to receive medical attention. He recovered and returned to Mexico to finish the movie, but he lost several pounds and was physically weakened by his condition. Despite his poor health, he completed The Burning Season and was eager to continue his plans to play M. Bison in Street Fighter, which was to be filmed in Australia in the autumn. Julia felt that this film would allow him to spend more time with his children, who were fans of the video game franchise and helped him prepare for the role. He received his second Saturn Award nomination for his performance, which was considered the high point of the otherwise poorly received movie. This would be his final role in a major film, with his last work being a supporting role in the TV drama Down Came a Blackbird, which was filmed in Toronto, Ontario during September and October 1994. His poor health was clearly apparent in these last three films because of substantial weight loss. Later in 1994, on October 16, Julia and Poloway attended the Metropolitan Opera in New York. After the opera, he was supposed to meet Marcos Zurinaga, a Puerto Rican filmmaker who directed Julia in the Argentine/Puerto Rican coproduction Tango Bar. Julia began feeling intense abdominal pain and had to be taken by ambulance to North Shore University Hospital in Manhasset, Long Island. He was initially not worried by the issue, reviewing the script for his intended role in Desperado from his hospital bed, but his condition worsened. Later that night, Julia suffered a stroke. He fell into a coma four days later, on October 20, and was put on life support. Another four days later, on October 24, Julia died due to terminal complications from the stroke. In accordance with Julia's instructions, his body was transported to Puerto Rico. A state funeral was held in San Juan on October 27, 1994, with Julia being escorted to the building of the Institute of Puerto Rican Culture, where a funeral ceremony was held. The service was attended by thousands of Puerto Ricans, with plena being played in the background. The burial ceremony was also attended by thousands, with La Borinqueña being sung by Lucecita Benítez prior to the procession. After stopping at San Ignacio de Loyola Church, the procession advanced to Buxeda Cemetery, where Rubén Berríos offered the final words. As Julia's coffin was lowered, a load of carnations was dropped from a helicopter while the crowd shouted ¡Viva Puerto Rico Libre!. Julia was a lifelong supporter of the Puerto Rican independence movement; on one occasion, he convinced his agent to allow him to do an advertising campaign on behalf of the Puerto Rico Tourism Company. Subsequent memorial ceremonies were held at Joseph Papp Public Theater in New York and in Los Angeles, where several actors and personalities, including Rubén Blades and Edward James Olmos, expressed their grief. A church mass in Miami and numerous private ceremonies were also held. The staff of Universal Pictures paid homage to him by dedicating Street Fighter to his memory, adding the phrase "For Raúl. Vaya con Dios." in the film's ending credits. Julia had been set to reprise his role as M. Bison in the video game version of the Street Fighter film, having already met with the production staff. The New York Shakespeare Festival paid to have an obituary in Variety, where his birth and death dates were accompanied by a quote from Shakespeare. The Puerto Rican Traveling Theater established The Raúl Juliá Training Unit, giving free acting classes to young actors. For his performance in The Burning Season, Julia was posthumously awarded a Golden Globe Award, a Screen Actors Guild Award, a CableACE Award, and an Emmy Award. Although he did not make his screen debut before 1950, Julia was a nominee for the American Film Institute's AFI's 100 Years...100 Stars. Actors such as Helen Hunt and Jimmy Smits have quoted him as a source of inspiration. On November 21, 1994, Rudy Giuliani declared that date "Raul Julia Day." In 1996, he was inducted into the Theatre Hall of Fame on Broadway. The Puerto Rican Chamber of Commerce created the Raúl Juliá Scholarship Fund in 1997, intended to provide college education for teenagers. During his life, Julia continued the work that was done by his parents during his childhood, cooperating with social and educational activities. Due to this, he was named to the New York Council for the Humanities. Among the targets of Julia's charity work were initiatives directed towards youth. Concerned with rising levels of violence among teenagers, he sponsored script writing in high school students and supported young actions. In order to promote other Latin American performers, Julia actively lent his support to the Hispanic Organization of Latin Actors (HOLA) and co-founded Visiones Luminosas, an initiative to promote screenwriters. He continued to work in the NYSF, but performed without receiving a salary. In a similar fashion, Julia cooperated with independent filmmakers in Puerto Rico by acting in their productions for free or receiving a low salary. This constant involvement with the Latin American community earned him a posthumous Hispanic Heritage Award. Julia also promoted interracial integration, being a member of Racial Harmony and serving as the chairman of the Joseph Papp Celebrity Coalition for Racial Harmony. As part of his work in The Hunger Project, Julia donated food to a food bank once every month. He also promoted the program on television and radio and served as narrator in bilingual videos. Julia opened slots in his schedule to participate in multiple benefit galas on behalf of the organization. Due to this work, the project gave him their Global Citizen Award. His involvement was also recognized in "Ending Hunger: An Idea Whose time Has Come". On March 24, 1992, Julia received the Courage of Conscience Award. In 1994, the government of El Salvador recognized his activism for human rights, granting him the role of overseer in their general elections in representation of Freedom House. During his visit to the country, he visited the tomb of Romero, subsequently describing his experience in a piece published in Freedom Review. In recognition, the National Endowment for the Hispanic Arts offers the Raul Julia Award for Excellence annually. In 2002, actress Sandra Bullock was presented with the award. She received it for her work as the executive producer of the George Lopez TV series, which offered work and exposition for Hispanic talent. 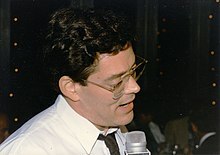 In 2003, Daniel Rodríguez won the first Raul Julia Global Citizen Award from the Puerto Rico Family Institute based in New York, receiving the recognition due to charity work. The Raul Julia Micro Society, a charter school located inside Public School 3 was named in honor of Julia. The school is located in the Tremont neighborhood in the New York City borough of the Bronx. The actor's training unit of the Puerto Rican Traveling Theater was renamed the Raul Julia Training Unit. The National Hispanic Foundation for the Arts (NHFA) honors outstanding entertainment personalities annually with their Raúl Juliá Award for Excellence. The award which recognizes individuals who have contributed to the growth and awareness of Latinos in the arts and media is awarded annually to many Hispanic and non-Hispanic personalities. Past winners include Cristina Saralegui (2010) and Sandra Bullock (2002). In 2000, the Hispanic Organization of Latin Actors (HOLA) renamed its Founders Award the Raúl Juliá HOLA Founders Award. 1974 The Bob Newhart Show Gregory Robinson Episode: "Oh, Brother"
1974 Great Performances Edmund Episode: "King Lear"
1984 American Playhouse Aram Fingal / Rick Blaine Episode: "Overdrawn at the Memory Bank"
^ a b Gussow, Mel (October 25, 1994). 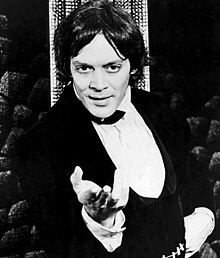 "Raul Julia, Broadway and Hollywood Actor, Is Dead at 54". The New York Times. ^ "Capitulo Eterno". fisigmaalfa.org. Archived from the original on April 15, 2008. Retrieved April 28, 2008. ^ "America's Greatest Legends: A compendium of the 500 stars nominated for top 50 "Greatest Screen Legends" status" (PDF). American Film Institute. Archived from the original (PDF) on September 19, 2009. Retrieved November 1, 2009. ^ "Jimmy Smits asegura que el actor Raúl Juliá fue su inspiración" (in Spanish). Terra.com. June 5, 2009. Retrieved November 1, 2009. ^ "The Peace Abbey Courage of Conscience Recipients". The Peace Abbey Multi-Faith Retreat Center. Archived from the original on February 7, 2009. Retrieved November 1, 2009. ^ "H.R. 2818: To award a congressional gold medal to the family of the late Raul Julia". The Library of Congress. July 22, 2009. Retrieved November 1, 2009. ^ Donna Shor, Around Town Archived December 25, 2003, at the Wayback Machine, Washington Life Magazine, November 2002. Accessed 2008-08-29. ^ Rita Charleston, ‘The Singing Policeman’ is on duty Archived August 27, 2009, at the Wayback Machine, Northeast Times, July 2003. Accessed 2008-08-29. ^ John J. O'Connor (November 4, 1986). "TV Review; HBO's Florida Straits' with Raul Julia as star". The New York Times. Retrieved November 1, 2009. Cruz, Bárbara C. (1998). Raúl Juliá: Actor and Humanitarian (1st ed.). New Jersey: Enslow Publishers. ISBN 0-7660-1040-6.